What is Seat Mover M2 and how it is different from other models? Seat Mover M2 – is the simplest and most affordable model for a motion simulator experience. 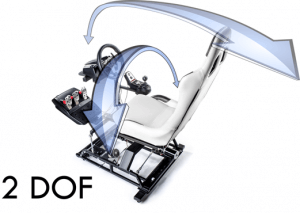 It is the most cost-effective motion simulator made for customers who already have a PlaySeat EVO or Next Level GT Ultimate or GT Omega ART frame, and want to experiment with motion simulation on a limited budget. Our Seat Mover is the same cost or in many cases a better and less expensive option than similar products on the market. Unlike the other platforms we sell, the Seat Mover M2 moves only the seat while the wheel and pedals plates are stationary. It is less immersive in the game as H2, H3, P2 or P3 models and it is limited to 2 DOF (Pitch and Roll). 1) If you purchase a new frame and our Seat Mover M2, you will spend almost the same amount as for H2 model. 3) The H2 and P2 move the entire platform, wheel and pedals plates together with the seat, adding detailed immersion to your game play. It is very compact (H 7.5″ x L 12.5″ x W 16.5″) H 19cm x L 32cm x W 42cm. It is easy to assemble, and easy to add to existing Sim chassis mentioned above. Plug and play software makes motion simulation quick and fun. It’s as easy as IKEA furniture. What’s the difference between the H3 (consumer) and P3 (commercial) versions? Our Commercial or Professional P series platforms (P2/P3) have a bit more force and speed. You barely will notice it while racing. The main difference is the commercial version extends the longevity of the equipment for continuous use. For home use the commercial platform (P2/P3) is unnecessary. The industrial version of our latest DOF Reality H2/H3 platform and is generally for commercial use only. However, we do recommend it for pilots with weight close or above 300 pounds (120kg) and/or pilots who play longer than 2-3 hour continuous daily sessions. The P2/P3 is based on industrial motors that can work many hours each day. The only difference between the H2/H3 and P2/P3 is the motors, gear boxes and power supply. The remainder of characteristics and parts are similar. What’s included in DOF Reality platform? Customers need to purchase their own seat, VR, and controllers (wheel, pedal etc). Our platform supports all of them. What is the difference between 2 DOF and 3 DOF ? What is Pitch, Roll, Yaw? What is the maximum pilot weight our platforms support? Commercial P models supports up to 330 pounds (150kg) of pilot weight plus average seat and controllers. Consumer H models supports up to 300 pounds (136kg) of pilot weight plus average seat and controllers. Can I put my full rig on your moving platform? Unfortunately the only option will be to move the seat itself to our rig. as it is properly balanced for COG while other heavy frames are made for a static mount. All controls such as wheel , pedals and shifters have to be mounted to our frame. It would be technically unwise to overload it with unbalanced weight. Static frames are good for static setups, but when it will be under rapid movements and G forces it will not stay stable. Our frame is specially designed and has gone through extensive testing and many iterations until it reached the current configuration to ensure rigidity over all movements spectrum, under heavy pilot weight, and even direct drive wheels. With all these benefits, our frame doesn’t contribute a lot to the total platform cost. Most of the price comes from motors and electronics. We don’t overprice our product as most competitors, marking their products up two to three times more expensive than ours. Our mission is to make plug and play motion simulator platform affordable for many gaming enthusiasts. You can put your controllers and seat on our platform and enjoy unique sensations that beat most of the expensive simulation solutions. What are seat mounts and H/P models dimensions? What are the dimensions of the M2F custom size bottom/floor mount seat mover? If it doesn’t fit you can use metal bracket/slider or metal late or plywood panned on the floor to mount our mover to it and it to the rest of the frame. What are V2 and V3 models of your product? We renamed V2 to H2 and V3 to H3. It was a lot of confusion with the old model names . What SimTools version do you provide with your platforms? If lower than actual version, is it possible to update? Are your products compatible with consoles? Consoles are a closed controlled proprietary platform. Now only few games, such as Assetto Corsa, PCARs, PCARs2, F1, Forza Motorsport 7, send motion data from consoles (UDP over network). In order for any Motion Platform to work, console game needs to send motion data to it (external application). If game is not sending movement data then the platforms cannot move. If your game can send motion data and PC with SimTools then software is used as a proxy. 1) Install SimTools software that we provide for the PC and the relevant plugin for your game. 2) Connect our control box via USB cable to PC. PC should be in the same network as Console to get telemetry data from the game. That will be sufficient. What I will get if I order? We are selling the complete platform. Each individual system is assembled, tested, and tuned. They’re disassembled before shipping, so all you need to do is put it together, install SimTools (provided) on your PC, and connect our controller via USB! All parts and tools needed for quick assembly of the platform are included. Do you have a demo system that I can see and try before purchase? Unfortunately, we don’t have a demo system and this business is so niche that we can’t afford to ship them around the world for this purpose. Even established companies with platforms 4-10 times more expensive than ours don’t provide demos. We don’t foresee demos coming in the near future, as our mission is to make the most affordable platform on the market. Many customers trust us and we have never had a customer who was unhappy with our products. 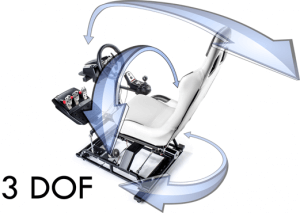 How to balance your motion simulator platform? To check the balance, disconnect both front motors arms – you’ll need one or two strong friends to help you! Ask them to hold the seat from the back left and right while you get in. Once you’re in, sit with your usual pilot posture. The platform should be almost perfectly balanced (not diving to the front and not to the left). It should be easy for your friends to hold it and it should be level with minimal effort. The goal is for you to move the seat and other parts to the COG balance point described above. The better you balance it, the better and longer it will perform. You might find advice online to balance it with counterweight, we strongly against this as you add unnecessary weight for the motors to lift and momentum to fight against with while changing directions. The best counter balance is your own body weight. When you’re done you can put motor arms back and check the performance. Can I put additional equipment on your platform? Yes, but you need to do it properly. Our platform is lightweight and simple due to its perfect weight balance. This allows us to use affordable motors and gearboxes. If you want to add something besides the standard wheel, pedals, yoke, gear shifter, throttle, and HOTAS, you will need to plan and implement it properly. Each additional piece of equipment (even a lightweight element) on the moving platform should be well positioned and counterbalanced (same weight and same arm length). You can’t put TV screen or computer monitor on our simulator, no matter how light it is. It’s always better to consult us before installing any extra equipment on the platform. Don’t put ANY controllers on the platform before it is completely tested working as desired. After assembly, only attach the seat. Nothing extra. Once the platform and the seat are working, you can start adding controllers one by one, doing movement tests with a person seating at the pilot seat after implementing each new add-on to the platform weight. Where I put some Buttkicker or shakers on your platform? The best place is under the seat attaching it to our seat with mounting brackets or hard parts of the seat itself. The closer you can place them to your body – the better the effect. You’ll need to experiment a bit if you aren’t sure that you will benefit from four of them. SimTools have a GameVibe feature to enable proper signal output from the games for Buttkickers. It’s the equivalent of SimVibe and you get it for free with our platform! You can pay with most credit cards and PayPal as well as SWIFT, SEPA, ACH Bank transfers . No, SimTools is not compatible with Linux. But you can configure your setup on Linux with our platform control SDK. What about space and replacement parts? DOF Reality systems are designed with almost entirely “commercial off the shelf” (COTS) components, which are provided by large scale multinational manufacturers. This means that sourcing spare parts for our systems long into the future will be trivial, since the use of commercial technology ensures long life spans and support for spares. Please follow this page to determine shipping costs. Can you do platform customization? Yes! We always accommodate customer requests. However, some platform customization can increase the cost of the unit. What max bank angle do I need from motion platform? Simulators are made to trick our brains in getting some sensations and our brains are very inaccurate as a bank angle meter, however it is a good accelerometer . That is why the relaxed body put in high salted water in the dark got completely confused of its orientation and position like weightlessness. So we getting sensations from acceleration, but not absolute positioning and here pitch/roll/yaw should be done just with enough speed and where it got stopped 10°, 15° or 20° degree doesn’t really matter for our sense of movement. What controllers (wheel, pedals, shifters, joysticks) seats your platform compatible with? Our platforms are fully compatible with virtually any controllers. Our stand was proven to hold even 19kg direct drive wheels without issues. How I can get vibration Bass body Shakers Transducers simulation with your platform? Motors or actuators can’t reproduce rumble frequencies 15-200 Hz just due to physics. This simulation can add realism in flight simulation as well as for racing when you feel the engine RPMs and driving surface. If you are looking for this type of simulation, you definitely need Bodyshaker, Bass Shaker, or Buttkicker. There is a ton of advice on the subject on the flight and race simulator forums and blogs. Normal sounds coming from game audio, forked to amp and shakers can reproduce only low frequencies ignoring the rest. Special sounds additionally generated by the game or add-on such as SimVibe or SimTools(GameVibe) dedicated for shakers. It can be done based on information the game provides to this add-ons such as RPM, gears shifting, and road bumps that car is heating. Based on this input sophisticated software such as SimVibe can generate dedicated audio signals to up to 8(7.1) mono channels to additional dedicated sound card that sends them feather to audio amp and to shakers that are positioned in special spots of simulated cockpit. Option A is easy to introduce, but might not be as realistic as players want. For option B, you will need to check what is supported by SimVibe for your game. SimVibe itself costs $89. SimTools 2.0 should have the same feature as SimVibe called Game Vibe, but currently it is in development. As for the amp and shakers, the sky is the limit in pricing and marketing promises. I suggests trying something simple with option A such as the forking analog audio output of your sound card to this AMP (don’t forget 24v power supply for it) + two basic shakers. Does you your platform work with Game Engines and development tools such as Unity3D? Yes, in Unity3D and others there is a library to send data directly to Arduino (that our controller is based on) over serial. Alternately, SimTools SDK can be used. There shouldn’t be a problem sending your telemetry data from Unity3D to SimTools, so it can set the platform position accordingly. Do I need to purchase something else to be able to use your motion simulation platform? DOF Reality is NOT a DIY (Do It yourself) kit where you have to invest a lot of time and money in order to make it at least somehow work. It comes as a ready-to-go, tested and tuned package with only minimal easy assembly required. You will get a complete working plug and play platform. Seat and game controllers are not included. What seat I should use with your platform? Almost any bottom mount car or gaming seat can be used. We don’t sell them as you can use the seat of your preference or get it cheaper locally. We suggest a Bucket (so you don’t fall off during Gs) Racing Seat and a four-six point harness is optional. The lighter the seat weight, the better the platform performance. If your seat is not a tight fit (wide), you might be pushed and sway left and right during Gs and a harness might be useful with it. You can find seats on eBay, Amazon, or JEGS. Real certified racing seats can be quite expensive, you can check second hand stores to save money. Ask for seat that is NOT certified for racing – they work the same way and are way cheaper than certified ones. In local classifieds, check for single racing seat. Alternatively, if you live near a big city search for a JDM company that imports used racing parts from Japan, most of them will sell single seats. Be sure to tell them that you don’t need a certified one. Finally, check the local racing community, they will be happy to help. The best will be to use standard bottom mount car seat with sliders/rails (as in real car). It provides you the opportunity for quick adjustments as well. I’m starting from scratch, is there a wheel and pedal/ shifter that you feel would work the easiest with your setup? Our platform is proven to support any controller, even heavy direct drive wheels. It all depends on your budget. We suggest you start with Logitech DFGT set. IMHO the rest of Logitech (G25-29, 920) have not much improvement compare to DFGT, but priced higher. If you will feel that you need more, go for the Thrustmaster TX/T300 wheel. For pedals, if stock Logitech or Thrustmaster won’t be enough check Fanatec CS Elite, ClubSport v1 or v2. CSP v3 have not much improvement compared to v2 and you can get great deals for v1 or v2 on eBay. We build and ship directly from our production plant in Europe, but not inside the EU. We ship with TNT. Our prices don’t include VAT/customs duty. Tax is usually the standard import tax for your country. We use HS code 9504 50 00 00 for the declaration. You can check your import taxes based on it. Will I need any additional Software? No, we will provide you the SimTools and all needed up to date plugins. Does your products packages include seat, wheel, pedal, gear shift other game controllers ? We have pre-drilled holes for mounting all Logitech and Thrustmaster wheels, if you have other wheel, just let us know the mounting points and we will be happy to do it for you complementary. Does your platform comes with predrilled holes for mounting wheels and other controllers? We have pre drilled holes for mounting all Logitech and Thrustmaster wheels, if you have other wheel, just let us know the mounting points and we will be happy to do it for you complementary. Can I use your platform with VR: Oculus Rift, HTC Vive and future products? Yes, you can use any VR. We have different ways to provide motion cancellation. You can use any VR set with or without the external reference tracking camera like (Rift or Vive). It is better not to mount camera(s) on motion platform. We have many users reporting better results when camera(s) mounted in front or the platform making sure it is always visible from any helmet location. We include mounts for Oculus as Vive is easy to mount on the top of the seat video. Some customers prefer it on the platform, some off. Depending on where your camera is placed, on rig or off rig, you can encounter the picture inside the HMD (Head Mounted Display) “jumping around.” This is due to the camera and headset working against each other as the VR hardware is not designed for use in motion platforms, there are a few ways to resolve the problem, however neither is ideal nor official. Attach the camera on the rig and blind the camera (cover it with something). This disables the 3D tracking preventing the camera at jumping around in game. This method also disables the rotation tracking, meaning if the simulator turns 90degrees IRL, you will have to turn your head 90degrees to look forward in game. That is why we suggest limit Yaw from 5%–10% making the rotation just enough for you to feel, but not notice needing to turn your head to look forward in game. Placing the camera off rig. This yields the same results as above; however, you are able to get off the rig and move around (also in game). You might move slightly around in-game depending on the settings of the simulator. Placing the camera on rig. If you wish to place the camera on rig and do not wish to blind it to get the full experience, you might need to turn down movement on the simulator to a low setting. This will minimize the “hopping” and will give you a smoother experience with the HMD. Here is are videos of one of our customers using VR. Will DOF Reality Hx work for me or I need Commercial Px platform? For the home use you don’t need Commercial platform. Industrial versions P2 and P3 of our platform are for Commercial use only. It is based on industrial motors that can work hours each day. The only difference is in motors + gear boxes and power supply. If the pilot weight is close to the platform limit 330 lbs (150 kg) we recommend to get Commercial P2 or P3 platform. 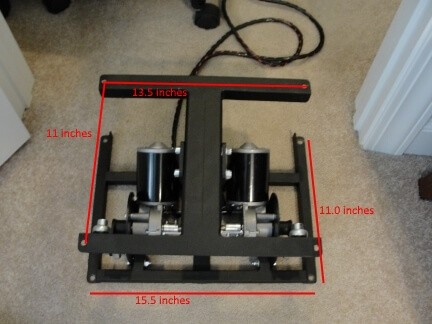 I have a custom built rig which already has wheel/pedals/shifter/ebrake which are attached to it. Is it possible to make a DOF Reality for seat only? Sure, we can do it as mechanical customization. We have to shift COG. Please contact us for specifics sales@dofreality.com. How you ship your platform to USA, Europe and other regions? Due to the lightweight design (19-58kg), our simulator can be shipped in two boxes. We suggest air shipping for a shorter lead time and better service. Prices do not include import taxes, duties customs and brokerage charges. Please email us when you need to adjust customs declaration form. We can use the courier of your choice if it is available in our area. How I can get CE and other certificates? If you have any questions or suggestions regarding our motion platform please contact us.